Client: Hello, I’m looking to register my trademark. I used the free search tool on your website and I see there is a [foreign country] company that already has the name registered here in the U.S. Can I still register my mark? Attorney: Well, if the mark is already registered for similar goods or services as those you are offering, probably not. Client: But they’re a [foreign country] company. Is that legal? Attorney: Yes, this is allowed. Client: Don’t I get some sort of priority since I’m based in the U.S.? I mean, I am a U.S. citizen and my company is here. Attorney: I completely understand. But foreign entities can own trademarks in the United States, as long as they are offering their goods or services in commerce here. Client: Well that doesn’t seem fair. What am I supposed to do now? Clients are often disappointed to find that the trademark name they are interested in using and protecting is already taken by someone else. This disappointment may be compounded if the mark is registered with the U.S. Patent and Trademark Office (USPTO) by a foreign entity. While far from the norm, we do receive a fair number of calls like the one characterized above – clients wondering why a foreign company should be entitled to trademark registration rights over a U.S.-based company. This may be a hard truth, depending on your perspective, but yes, foreign companies and foreign nationals have the same rights as U.S. residents, citizens and U.S. companies to use and register their trademarks in the United States. As long as the goods and/or services are offered in U.S. commerce, this is permitted under U.S. trademark law. On the flipside, this rule works in favor of U.S. companies abroad as well. 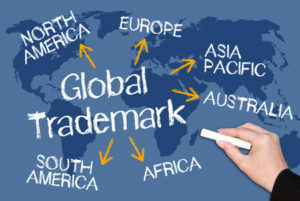 If you are seeking to sell your goods or services in overseas markets, and protect your brand name there, there is some uniformity in global trademark law (for the most part) that allows U.S. residents, citizens and companies to seek and obtain international trademark protection in foreign countries. Trademark registration rights are geographic in scope. If you own a U.S. federal trademark registration, it does not offer trademark protection outside of the United States. If you want to protect the trademark used in connection with your goods or services outside of the U.S., you must seek international brand registration in each country or foreign jurisdiction where you want trademark protection. The most common international trademarks we work with are in Canada, the United Kingdom and the European Union. Trademark registration in Canada would protect your mark and provide rights to exclusive use of your trademark in Canada, even if you are a U.S. company. The same applies for UK trademark registration and in the European Union. Do You Need International Trademark Protection? One of the first steps in the international trademark registration process is to determine whether you need international protection in the first place. As long as you are offering your goods or services in commerce in a foreign market, you may be entitled to obtain trademark protection. Do I conduct business outside of the U.S.? Do I export my products overseas? Do I manufacture my products overseas? Can I afford international IP protection? What are the relevant international markets? What is the likelihood of my product being copied and sold abroad?Am I aware of foreign competitors who may attempt to sell counterfeit copies of my goods? If you have answered yes to one or more of the above questions, international trademark protection may be right for your business. It is important to identify the specific markets in which you are interested, however, since there is no such thing as a “global” or “international” trademark. You must apply in each country or region where you want protection, and the fees vary by country. Fortunately, the process for seeking international trademark protection has been somewhat simplified through the “Protocol Relating to the Madrid Agreement Concerning the International Registration of Marks,” or simply, the Madrid Protocol. Unlike regional trademark registration agreements or treaties, the Madrid Protocol does not provide comprehensive trademark registration and protection in every member country of the Protocol. Rather, it allows trademark owners from the various Members States to file a single application that can be extended to obtain protection in other individual Member States. In order to apply, an applicant must be a national of, domiciled in, or have a real and effective business establishment in one of the Member States of the Protocol. The fees for international trademark registration vary, depending on a number of factors concerning the mark itself, the number of classes specified and the Member State(s) listed in the application. In addition to any applicable legal fees, Madrid Protocol applications also incur USPTO certification fees for each class of goods or services and international fees for the International Bureau of the World Intellectual Property Office (WIPO), in addition to country filing fees. Another option for obtaining international trademark protection may be through a direct filing with the country or regional trademark office. If you are applying in the European Union, for example, we have relationships with local counsel to represent your application before the European Union Intellectual Property Office (EUIPO). If you are interested in trademark registration in Canada, we work with local attorneys to file your trademark application directly with the Canadian Intellectual Property Office (CIPO). The requirements and fees for direct country filings vary by country or regional office, but since there are fewer administrative management fees (from the USPTO and WIPO), many clients find direct filings more cost effective than applying under the Madrid Protocol. While you may be frustrated by a foreign entity holding your U.S. trademark name, you may be relieved to know that your company is similarly entitled to obtain international trademark protection in other countries. There are various options available for protecting your trademark or brand name overseas, whether through the Madrid Protocol or direct in-country filing. Either option protects your mark and helps to ward off foreign trademark competition in your relevant markets. For more information about international trademark registration, country fees and how to get started, please contact a trademark attorney at Flat Fee Trademark. You can reach us by email, call us at (800) 769-7790, or use the Live Chat feature on our website. We are always happy to hear from you!